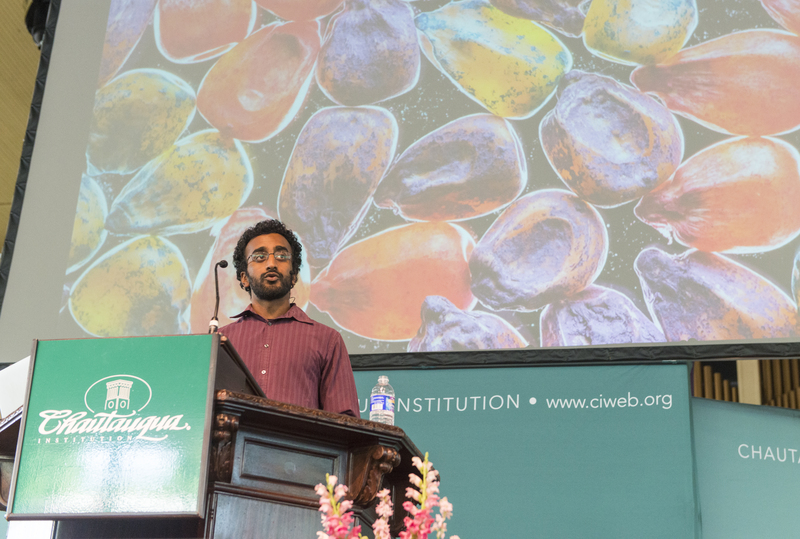 Amand Varma shows a photograph of neonicotinoid treated seeds that are used as a pesticide on Friday, August 7, 2015. While direct contact these pesticides can kill hundreds of thousands of bees, Varma does not think neonicotinoids are the single cause of Colony Collapse Disorder. A year-and-a-half ago, National Geographic commissioned Anand Varma to investigate the disappearance of honeybees. To conduct his research, Varma didn’t just document bees. With the help of a local beekeeper, he started raising them in his backyard. Varma, a freelance photographer, took the Amphitheater stage Friday for the final morning lecture of Week Six, “Vanishing.” He photographed National Geographic’s May 2015 cover story “Quest for a Superbee.” He brought insights from his journey into the mysteries of honeybee disappearances, or colony collapse disorder. He began the lecture by showing photographs of the biodiversity in Panama’s mangrove forests, home of animals such as the turnip-tailed gecko and the leafhopper bug. These species have been the victim of deforestation by shipping companies looking for storage. After cutting down coastal trees, the companies fill the wetlands with soil. This has the added effect of killing the surrounding forests because natural drainage is halted. Deforestation is the main threat to biodiversity because it isolates habitats into islands, robbing environmental interconnectedness and causing imbalances, Varma said. Similarly in Argentina, development has caused desertification, which imperils species like the Argentine tuco-tucos. For example, a foreign fungus called chytrid threatens the mountain yellow-legged frogs that live in the Sierra Nevada Mountains. It dehydrates the amphibians, disrupts their electrolyte balance and causes cardiac arrest. Varma’s colleague found some frogs were resistant to the fungus because of unique bacteria. He collected the bacteria, grew it in a lab culture and soaked select frogs in a “froggy spa.” He discovered this was effective at extending resistance and saving portions of the population. For all he had seen, Varma didn’t fully appreciate the effort it takes to fix problems such as deforestation and foreign pathogens until he embarked on his bee odyssey. Of the roughly 4,000 species of bees native to North America, honeybees are not one of them. They originated in the Fertile Crescent of ancient Mesopotamia and Egypt’s Nile River Delta 3,000 years ago. Mesopotamians and Egyptians were the first people to harness and raise bees on their own for their honey. When the New World was colonized, Europeans brought honeybees with them. His investigation took him to Baton Rouge, Louisiana, where the U.S. Department of Agriculture has a honeybee lab. First, he looked into the effects of pesticides, the most commonly thought of reason for colony collapse disorder. There are tens of thousands of pesticides in use, but few people know what the formulations are actually composed of. Companies are only required to register an active ingredient, while other so-called inert ingredients fall under “trade secrets,” Varma said. Scientists discovered these additives thought inert actually have sublethal effects, which means it wouldn’t kill bees, but it would inhibit them from remembering where food or the hive is. High concentrations of neonicotinoids, a relatively new type of pesticide meant to combat crop pests, can kill up to 100,000 bees at a time. Bees can carry the poison from their pollination back to the hive, causing widespread nervous system failure, disorientation and death. But as dangerous as neonicotinoids and other pesticides can be for their unintended targets, Varma said the exposure rates to high doses was too low to account for colony collapse disorder. In addition, the location of pesticides did not correlate to the areas of high colony collapse. There had to be more to it, he said. Another cause of colony collapse is an Asian mite that migrated to the Americas called the Varroa destructor. The parasitic mite will burrow into larvae’s shells as they grow and reproduce there. Special worker bees will police the young and kill ones with mites, but this doesn’t always save the hive. There are mite-resistant honeybees, so the next scientific quest became reproducing mite-resistant traits, according to Varma. A normal queen bee will reproduce in flight with as many as 20 male bees. In the lab, scientists use artificial insemination, which has the negative side effect of filtering genes and robbing bees of other diverse characteristics such as increased honey production. For this reason, Varma said the artificially bred, mite-resistant honeybees are not popular among beekeepers. Honeybees are not exclusive pollinators; there are several thousand bugs that do the job as well, such as wasps, butterflies and flies. For a time, honeybees were able to supplant many of those pollinators. But the Varroa destructor has wiped out many hives. This, coupled with habitat loss, has contributed to honeybees’ inability to pollinate the environment on their own. Varma said they are not endangered as there is a global spread of honeybees across the continents, but they remain a part of the American environment that is suffering and taken for granted. “I think the best path forward is protecting as much habitat as possible so that we’re not relying just on one species for so much of our food supply and investing more in understanding the basic biology of living things so that we can design solutions to help them deal with pesticides, pathogens and all these stress factors,” he said.